It was 10 a.m. on a summer day around this time last year. I am standing in the tomato patch at Cumberland Crossings, a Diakon senior living community in Carlisle, Pa. Next to me are Denzel, a student from Diakon’s Center Point Day Treatment Program, and Elena, an intern from Dickinson College. I reach my hand into the tomato plant in front of me to grab a ripe cherry tomato hidden under some branches, but my hand encounters something along the stem soft and squishy. 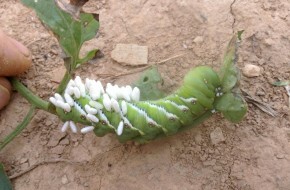 I pull the branch down to take a better look and find a tomato horn worm.